This stunning, fine and impressive antique emerald brooch has been crafted in 9 ct white gold with platinum settings. The pierced decorated frame features an impressive collet set 2.50 ct square step cut natural emerald flanked above and below by an individually set Old European round cut diamond. The pierced decorated geometric design is further embellished with a combination of seventy-two pavé set Old European round cut and eight-cut, well colour matched diamonds. The borders of the pierced decoration are accented with millegrain decoration. 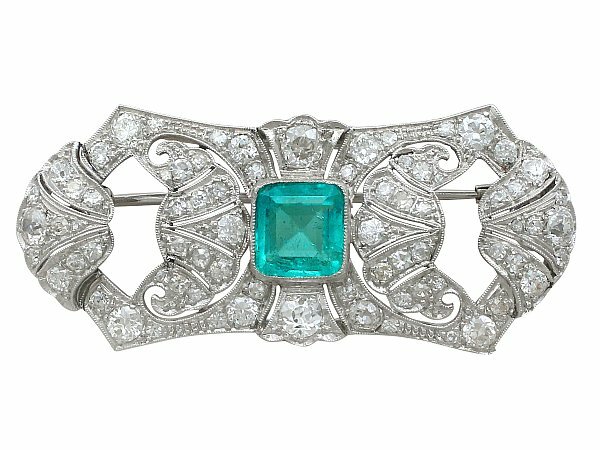 The 1930's emerald and diamond brooch secures to the reverse with a hinged pin and secure push fit clasp. This stunning brooch has been independently tested using state of the art technology (Niton XL2 Analyzer) and verified as 9ct gold and platinum. This emerald and diamond brooch is supplied with an independent diamond grading report card . 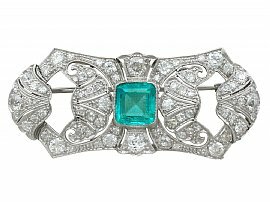 This stunning original antique brooch is fine quality set with a stunning natural emerald and well colour matched, very high colour graded old cut diamonds. Reflections in photographs may detract from the true representation of this fine antique emerald brooch. Length of setting at longest point 5.2cm/2.04"
Width of setting at shortest point 2.3cm/0.90"